I spent today paging through travel guides at Borders. It looks like Belize and Costa Rica have the best wildlife travel (looks glorious for ecotourism! ), but Guatemala has a richer crafts tradition, particularly in weaving. Friend of a friend who went backpacking through Central & South America recommended a place to study weaving–looks like there’s plenty of opportunity to spend time with local people, which would also be really cool. I also looked briefly through other areas, like Peru, Brazil, Nicaragua (which is apparently quite safe these days), and even toyed briefly with the idea of going to Africa. The main argument against Africa is the expense–it costs $1500-2000 for a round-trip ticket. Once I have my financial feet back under me, I’ll think about it…but even then, I’d want to go there for at least two months, it’s not really worth it for short trips. I guess I’d better wait until Openwave lays me off again. LOL! But Guatemala sounds like fun, it’s pretty cheap to get to, even cheaper to stay (Rough Guide says under $10/night is available almost everywhere), rich cultural tradition (think “Maya”), and lots of local craftspeople. So I think that’s where I’m going. Now I’m dusting off all my travel bits and pieces, and thinking about vaccinations. Guatemala doesn’t have anything really exotic, so malaria, typhoid, and hep A/B are pretty much all I have to worry about. Malaria is only an issue in a few places, so I’ll do some more research on that, get my typhoid and hepatitis vaccines, and that should be it. I have a basic med kit (which, by the way, I never used ONCE the entire time I was in SE Asia), so dig out the travel clothes, pack a drop spindle, and I should be set. I have wanted to try making a “Fire” shawl–I’m envisioning it in shades of gold, orange, copper, red–so maybe I’ll dye a few ounces of silk in those colors. I really won’t be able to spin much of anything in just two weeks (the travel shawl took a good six months! ), but I could get started…or maybe I’ll dye some orange and black silk and make TravelingTiger socks. Tomorrow, however, I’m going up to Berkeley to have lunch with a lace expert (the guy who owns Lacis), and I’ll ask him if he knows of anything interesting in South/Central America. If he does, it might change where I’m going. So, the Traveling Tiger and I will go off in search of his relatives. 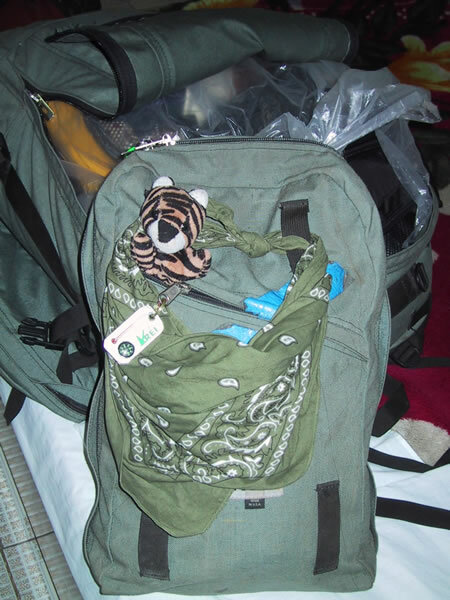 Here’s a photo of The Traveling Tiger (nestled in my backpack)…doesn’t he look like a suave, experienced world traveler? All he needs is a little Indiana Jones hat and a bullwhip, and he’ll be right off.